16 oz. Eyewash Solution in screw cap bottle fits most wall mount stations. 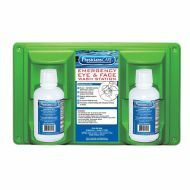 Plastic Wall Mounted Eyewash Station, two 16 oz. 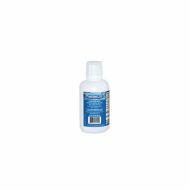 Eyewash Solution Bottles. 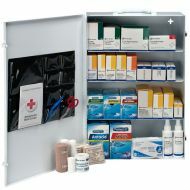 First Aid Cabinet 6155, 100 Person 3-Shelf Industrial, Wall Mounted Steel Cabinet. 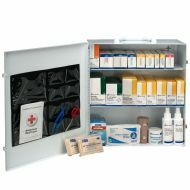 First Aid Cabinet 6175, 150 Person 4-Shelf Industrial, Wall Mounted Steel Cabinet. 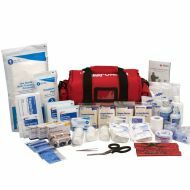 Portable First Responder Kit, Large 158-Piece. Red Bag.